When a community joins together in experiences to learn about rites of passage like the Rite Of Passage Experience© ROPE® they increase their understanding of youth and community development through rites of passage and can use a common language and specific techniques to integrate strength-based approaches, including developmental assets, character education, asset-based community development, social-emotional learning and resiliency within all of the design features of youth and community development through rites of passage. These are some of the ways that the exemplar of the community-oriented rites of passage the Rite Of Passage Experience© ROPE® promotes positive youth development and supports methods like developmental assets. Rites of passage in general and the ROPE® initiative specifically provides a vehicle to integrate a number of important youth and community development approaches, including the 40 developmental assets proposed by the Search Institute . Family Support: Parents/guardians are involved in rites of passage activities like designs featured in ROPE® and connections between them and other members of the community are made through shared experiences, common language, and shared skill building for human development. A community “Ceremony of Commencement” is a “Call to Action” and begins the multi-year engagement process for a community’s rite of passage experience. Positive Family Communication: Youth and parent(s) engage in shared skill building and experiences that include mutual problem solving and communication skills. Parent(s) and youth share a language to discuss the challenges of coming of age within a family. ROPE® for parents/guardians aligns with their children’s Rite Of Passage Experience and addresses the “Collision of Transitions” between the stage of midlife for parents and adolescence for their teenagers. 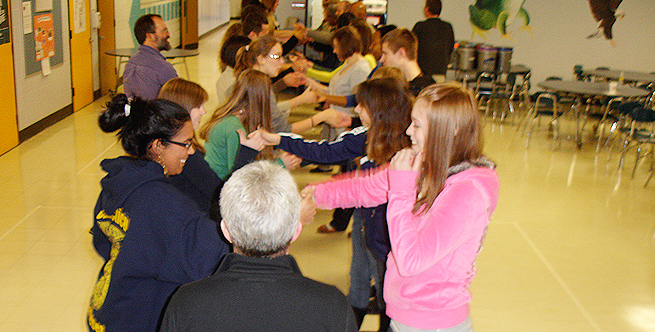 Other Adult Relationships: Youth have at least three other Guides they may connect with during their community-oriented rite of passage like in ROPE®, including a high school mentor. Authentic relationships forged during community rites of passage - ROPE® are deep and long lasting providing ongoing support and fostering attunement to responsibility = accountability. Caring Neighborhood: A community uses ROPE® to tie their assets and youth development resources together within a common language that supports a cohesive approach. The common language and shared experience facilitates greater connection and caring between neighbors. Caring School Climate: Youth engage in highly desirable and fun activities during school, which transfers into a student's perception of greater bonding and attachment to school. Parent Involvement in Schooling: Parents/guardians join with the school in ROPE®. “All children are our children” becomes part of the overarching story. Prescribed skill-building sessions, parent group experiences, and parent involvement are included in student ROPE® challenges. Youth as Resource: ROPE® provides an authentic context where the community expects that coming of age requires “giving back" for youth to be recognized as moving towards maturity by engaging in community service. This service increases their capacity, and sense of mastery and competence. High school youth, who’ve experienced ROPE® earlier serve as mentors for younger students entering the initiatory process. Service to Others: High school students are trained to facilitate ROPE® skill building sessions for youth moving from primary to secondary school, and they mentor younger students. Communities have intentional supports that guide youth into community service. Safety: Physical and psychological threats are mediated by the common language and shared experience of a community rite of passage like ROPE®, which serves to build a sense of community and diminishes feelings of isolation and disconnection. A broad array of adults is accessible to youth and helps to weave a safety net for all youth. Boundaries and expectations are achieved when youth have opportunities to engage in meaningful dialogue with adults to establish clear rules and consequences in the major environments that impact their lives. Family Boundaries: One parent said, " ROPE® provides a common language for us to talk to our children during the turbulent times of adolescence." Youth and parent skill building sessions focus on communication, boundaries, and shared values. School Boundaries: ROPE® groups empower students to establish their own guidelines for working together and to co-create their own process for mediating disputes, skills they can call upon when interacting in the larger school community. Neighborhood Boundaries: "It takes a whole child to raise a village." Community dialogue and parent networking are cornerstones of ROPE®. Pathways are established for parents/guardians and citizens to join in supporting youth development. Adult Role Models: ROPE® engages many citizens to be involved in the lives of youth and establishes many opportunities for their involvement. Positive Peer Influence: A positive peer culture is cultivated through ROPE®. School, parent, and community resources are coordinated to provide opportunities for youth to engage in fun and meaningful responsible behavior. Youth are systematically guided to health promoting activities and community service. High Expectations: The language and experience of "challenge by choice" set high expectations, which are transferable to a student's life. The common language offer a way to communicate shared values and expectations for behaviors, such as giving back and community service as measure of and symbols of maturity. Constructive use of time is achieved when youth are systematically guided into meaningful and health-promoting connections with major environments that impact their lives, especially the natural world and achieving a sense of “place.” This is a central focus of the second phase of ROPE® that sets forth the expectation for all middle school children to find their bliss. Creative Activities: Youth explore concepts related to having fun and are guided to explore and experiment with health promoting recreational activities. Helping a child find their bliss is the best protective factor in preventing problems and promoting health. Youth Programs: A cornerstone of ROPE® establishes a community expectation that youth will engage in after-school activities and has the language and context for this to systematically happen. Religious Community: ROPE® uses a language that serves as a bridge between secular and non-secular rites of passage. It links youth to religious organizations and links religious organizations to each other. Time at Home: The community establishes values, translated for youth through rites of passage - ROPE®, that set an expectation for the productive and healthy use of leisure time at home. Commitment to learning is achieved when youth are engaged in skill development directed to help them accomplish increasingly difficult challenges that build pathways to learning and a success identity. The Initiation of Scholars® portion of ROPE® specifically focuses on building important skills for academic success and helping children understand the importance of learning how to learn. Achievement Motivation: Accomplishing cognitive and physical challenges build a “success identity,” which helps motivate students to stick with difficult challenges. Experiential activities help to deepen the lessons learned and make them readily available to inform and guide healthy decision-making and ongoing learning. School Engagement: Adventure-based learning, within traditional educational settings sets new and deeper pathways to engage students in the joy of learning, which is transferable to other settings and subjects. Homework: ROPE® sessions focus on planning, ways to learn, and goal setting, and they include specific homework for both youth and parents/guardians. Bonding to School: Powerful positive experiences impart important knowledge and skills to students, and are supported by caring, nurturing adults. This fosters bonding between youth and school. Reading for Pleasure: Students enjoy reading books which feature rites of passage themes, and relating those stories to their ROPE® sessions and their own rite of passage experiences. Caring: Students learn about caring and helping other people and have roles available to mentor others and provide community service. High school students help facilitate ROPE® for 6th graders and serve as role models and mentors to younger students influencing them to become a good student, “scholar” and the importance of finding their bliss. Equality & Social Justice: Students may select a service-learning project to improve their community and/or the lives of others. In general initiation guides students to a consciousness where social justice is a call to action in service of the greater good. Honesty: Guidelines within ROPE® groups set clear standards for trust and honesty. Guided group experiences strengthen positive standards for compassion and caring that are reinforced within the community, which is present for supporting accountability. Responsibility: Group challenges present opportunities for youth to explore and experience individual and group responsibility. When rites of passage occur within the place youth live accountability for behaviors is inherent throughout their daily lives. Restraint: Parent and youth value-discovery sessions – the exploration of the problems and concerns of teenagers – and intensive life skill building exercises serve to form strong protective factors against health compromising behaviors. Social competencies are achieved when youth are given opportunities to learn skills, attitudes, and beliefs that give them the interpersonal competency and confidence to be with people of different backgrounds and engage in health promoting life styles. Planning & Decision Making: Life skills sessions focus on planning and goal setting and offer opportunities for students to practice those skills and test their level of development throughout their community. Interpersonal Competence: The intensive group experience of rites of passage, especially ROPE® is a laboratory for students to explore a broad range of individual and interpersonal issues while engaging in collaborative problem solving experiences. Cultural Competence: ROPE® explores the human history of creating rites of passage as a shared experience and amplifies cultural context to promote unity in the community. Resistance Skills: ROPE® offers powerful teachable moments that invite youth to explore the impact of peer pressure. Peaceful Conflict Resolution: ROPE® offers experiences that support student’s skills in communication, problem solving, how to “calm down” during stressful situation and conflict resolution. Positive Identity is achieved when youth engage in activities that help them derive meaning in living, as well as a sense of purpose and a perception of hope for their future. Personal Power: Adventure-based activities present opportunities to overcome challenges and grapple with life-threatening ordeals , which gives students a greater sense of social and personal mastery. Self-Esteem: Accomplishing difficult physical and cognitive challenges increases a student’s sense of personal power, sense of autonomy and self-determination. Sense of Purpose: One central purpose of rites of passage is to help youth achieve a sense of identity, meaning, and purpose in their lives. Positive View of Personal Future: Rites of passage are the traditional way for youth to gain a "vision" for their lives. It helps them to have hope and to see how they can become a valued adult in the community.